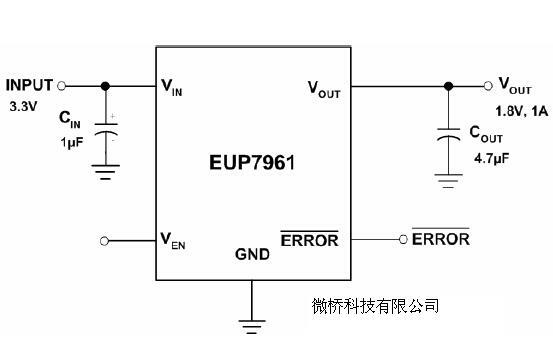 The EUP7961 operates from an input of 2.5V to 5.5V. This regulator uses a 1µF ceramic input capacitors and a 4.7µF ceramic output capacitor to deliver 1A output current. High bandwidth provides excellent transient response. It is designed to power digital circuits requiring low voltage with high currents (i.e., PLDs, DSPs, microcontrollers, etc.). flag output that goes low when the output voltage drops 10% below the nominal value. feedback voltage. The adjustable output voltage can be set from 0.8V to 4.5V.